A Klingon is running through a cornfield. He’s pursued by some weird aliens with apparent shape-shifting abilities. 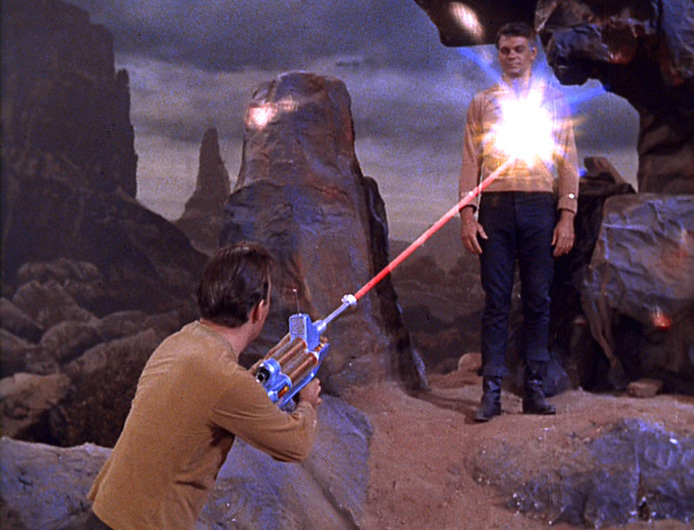 After the the Klingon kills the aliens, a human farmer shoots him with some sort of gun. Turns out this all happened more than 200 years since last we saw Trek (when Voyager was last seen being illogical and goofy) and more than a century before Kirk was knocking boots with hot alien females. There’s no Federation yet, but Starfleet is close to launching its first deep-space mission on the starship Enterprise (NX-01), captained by Jonathan Archer (Scott Bakula). Archer is called to a meeting where Starfleet brass and their Vulcan advisers are discussing the the injured Klingon. Archer uses the opportunity to return the Klingon, Klaang (Tommy Lister) to his homeworld to launch Enterprise ahead of schedule, despite the Vulcans’ objections. In exchange for some Vulcan star charts, Archer takes on Vulcan T’Pol (Jolene Blalock) as his science officer. En route, the ship is boarded by more of the weird aliens (the Suliban, we learn) and Klaang is captured. Unwilling to give up, Archer takes some information passed on from Klaang (pre-capture) and heads to Rigel X. There, he learns that the Suliban, Klaang and others are part of a “temporal cold war,” and that the Suliban are trying to destabilize the Klingon Empire. Eventually, using information from Rigel, the Enterprise finds where the Suliban are keeping Klaang, rescue him and — after a short battle — take him to Kronos. With its first mission accomplished, Starfleet tells Archer that the Enterprise should keep going and begin its historic mission. Well, as this is humanity’s first step toward what we would see in the previous series and movies, it’s a huge, huge part of the Tapestry. It largely explains how humanity got from its first use of warp technology and encounter with the Vulcans in “Star Trek: First Contact” to its first step toward a new frontier (to quote another Trek captain). It’s interesting, too, that we see humanity’s first dealings with Klingons (which will have huge, huge consequences) and the introduction of the Suliban, the main bad guy for this series over its first two seasons (notably Silik and his weird shadowy overseer, too). Plus, we see the strained relationship between humans and Vulcans, which is one of the major underpinnings of this series. Enterprise did a nice job of trying to appear less technologically advanced than TOS while not forcing viewers to look at 1960s-era sets and effects. That said, there were obvious items where the creators were too lax — notably that Kirk and Spock were so puzzled by cloaking technology in “Balance of Terror” when Archer and Co. see it here and throughout the series. Beyond that, it’s a little surprising just how close Kronos apparently is to Earth. Archer says it’s a four-day journey at maximum warp, which, at this point in time, is warp 5. So, in other words, a Klingon ship traveling at high warp could get to Earth in LESS than four days, possibly much less? Somehow, that seems off. And, of course, there’s the big-picture question as to why we’ve never heard of this Enterprise before, or Archer, or the Suliban, etc. I sort of hate head cannon, but I always thought the easiest explanation was that some time travel in previous Trek (the events of “Star Trek: First Contact”, perhaps?) changed what would have been the history as it stood in TOS and after — and a similar method was used in J.J. Abrams reboot. Of course, the real answer is a lot easier: The idea for the prequel wasn’t around before 2000-01, so writing a mention of Archer et. al into any Trek filmed BEFORE then was impossible. Such prequel. Much continuity questions. This is a pretty solid pilot with some nice nods toward continuity (despite the conceit mentioned above). It’s interesting to see humans who are less refined and not the galactic leaders that they would be in other series. It’s worth noting that Enterprise, as a prequel could be arguably the most Tapestry-worthy series of them all. With respect to not reviewing every episode or every other episode, we’ll be extremely strict about our criteria and review episodes in bunches where appropriate (especially in the more serialized seasons three and four). Archer can’t get “My Blue Heaven” out of his head. The Enterprise, under the command of James Kirk (William Shatner) attempts to cross the barrier between galaxies with disastrous results. 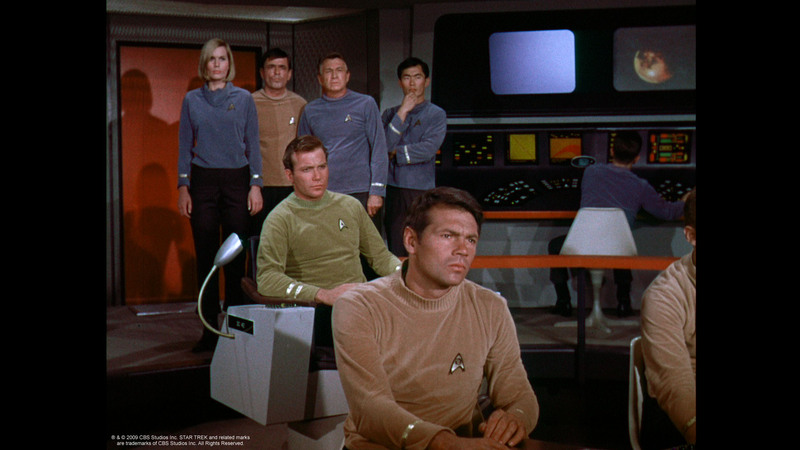 The ship is badly damaged and Kirk’s old friend and navigator Gary Mitchell (Gary Lockwood) starts displaying weird powers (silver eyes, increased reading abilities, telekinesis, love of bad poetry) and a dangerous god complex. 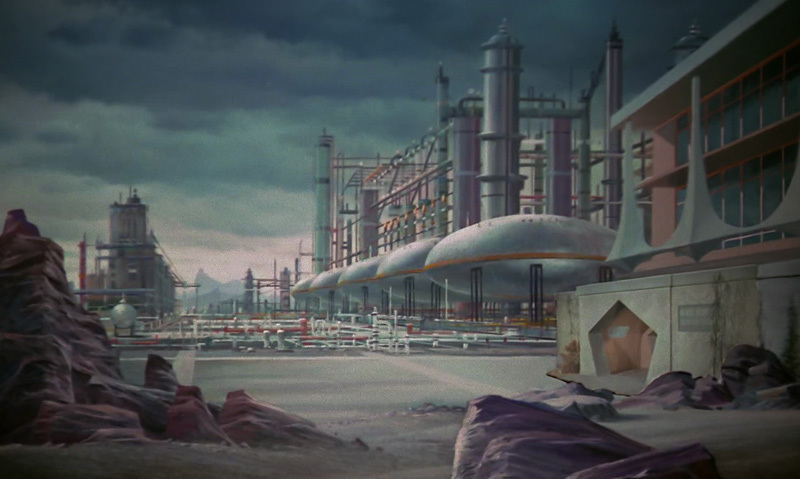 Kirk and Spock hatch a plan to cannibalize parts to repair the Enterprise from a nearby unmanned lithium-cracking station and to maroon Mitchell there. With the ship repaired, Mitchell escapes imprisonment on the planet and takes with him Dr. Elizabeth Dehner (Sally Kellerman), who was affected in a similar way to Mitchell but took longer to show symptoms. Kirk follows them and defeats and kills Mitchell, thanks to help from Dehner, who dies after the struggle. Kirk returns to the Enterprise and sets course for the ship’s next assignment. As the second pilot, this episode introduces Kirk, Scotty (James Doohan) and Sulu (George Takei), but it’s foundationalness (if that’s a word) as far as events go is sort of borderline. Few concepts about Earth, the Federation, Starfleet, etc., are introduced here that aren’t in “The Cage”. Most notable is probably talk of Starfleet Academy (where we learn Kirk was an instructor) which sort of underscores the idea of Starfleet as an exploratory/military-like service (along with the dialog about crossing the galactic barrier). There’s a general sense that humans explore the galaxy, but with few specifics — other than name dropping of some random planets and random stories re: alien “rodent things” that attacked Kirk and Mitchell back in the day. Everyone get in frame, someday some nerds are gonna need this photo for Internet! 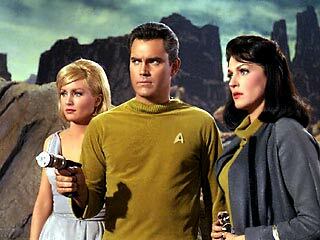 The episode does introduce Kirk, who is an important person in galactic history (Sulu and Scotty, as well, to a point). It’s also an interesting sort of half-step between “The Cage” and “The Corbomite Maneuver” (the first episode filmed in regular production). We see the original uniforms but the ship looks more like what we see throughout the series (the colors are MUCH less muted). As noted in our review of “The Cage,” this episode is Trek’s adventure pilot, because it sets up Kirk as the dashing hero (much more than Pike was in “The Cage”). Apparently, that was the goal of the second pilot — to be less cerebral, and this episode does a better job of balancing the cerebral with action. Still, Kirk’s dialog with Dehner about what Mitchell hasn’t learned in his accelerated progression to godhood is interesting stuff. The biggest issue is that this episode appears to take place well into the Enterprise’s five-year mission — which runs counter to established Trek history that says this episode was at the beginning of the five years (which sort of explains the lack of McCoy and less of a buddy-buddy relationship for Kirk and Spock). Also odd is the familiarity among the crew and lines about how some of them have served together for years. There are also lines of dialog — Mitchell saying a poem written in 1996 is from the “past couple of centuries” — which show the creators hadn’t quite figured out a timeline for Star Trek. This is a problem for a lot of TOS, which seems to take place in the late 22nd century at some points (Kirk telling Khan in “Space Seed” that he’s been asleep for two centuries) and in the late 23rd at others (Kirk’s scenes with Dr. Taylor in “Star Trek IV: The Voyage Home”). It’s always been my theory that this stemmed from a belief, in the 1960s, that space exploration would be a lot farther along by the late 1990s than actually happened in real life — and the creators had to push back events accordingly. Case in point: As the Enterprise gets close to the barrier, it finds the ship’s recorder from the S.S. Valiant, a vessel that apparently tried to leave the galaxy two centuries earlier (and ran into problems the Enterprise faces when it goes through the barrier). Do the math — this episode takes place in 2264 — meaning we’ll apparently have ships fast enough to get to the galactic barrier sometime in the next 86 years or so. Even if we accept the “Star Trek: First Contact” backstory, that humans travel faster than light in the 2060s, it’s just absurd to think we’d be traveling this far in the subsequent decades (and it certainly runs counter to “Star Trek: Enterprise,” in which humans don’t really leave the solar system until the 2150s). But, as I said, the creators in 1966 probably thought we’d be a lot farther along with space exploration by now than we are — and probably never figured that, nearly 50 years later, geeks like me would be dissecting stuff at this level. Of course, the other part of this problem stems from the issue of distance, something TOS really shrugged off most of the time with a wink and a nod. Even if you figure the Valiant somehow got to the galactic barrier in the late 21st century (wormhole, maybe?) 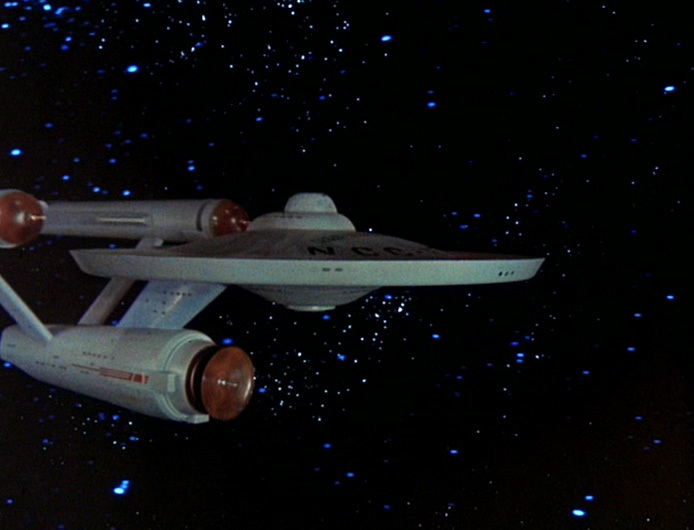 the whole idea of the Enterprise making it there doesn’t hold up to scrutiny. This is just bad science, and we see it throughout TOS and in the movies. I’m not gonna crack! Except on Delta Vega, that’s all anyone does with lithium there. And let’s say the Enterprise can get to the galactic barrier using conventional warp. How is there an unmanned lithium-cracking station so close — within reach on impulse — to the galactic barrier, which is, put another way, the edge of the galaxy? Are the unmanned ore ships that go there “every 20 years” according to Kirk really fast enough to get there — and for it to be worth it? Earth must really dig that lithium. The Milky Way sure seems larger (appropriately so) in second-generation Trek. Now, some of you — if you’re not trying to find a way to retcon this stuff — are saying I’m being too hard on a pilot. But the speed/distance problem is something that occurs throughout TOS and even in the movies (remember how absurdly easy it was to get to the center of the galaxy in “Star Trek V: The Final Frontier”?). I’m simply pointing it out here to note where this issue started. Heck, it sort of started in dialog in “The Cage”, but it’s far more obvious and a lot more specific here. Of course, a lot of the characterization is off in this episode. Kirk is pretty much the same guy we see throughout the series, but Spock isn’t Spock quite yet. Besides the smiling we see here and in “The Cage”, he acts more like Worf in TNG than Spock in TOS. 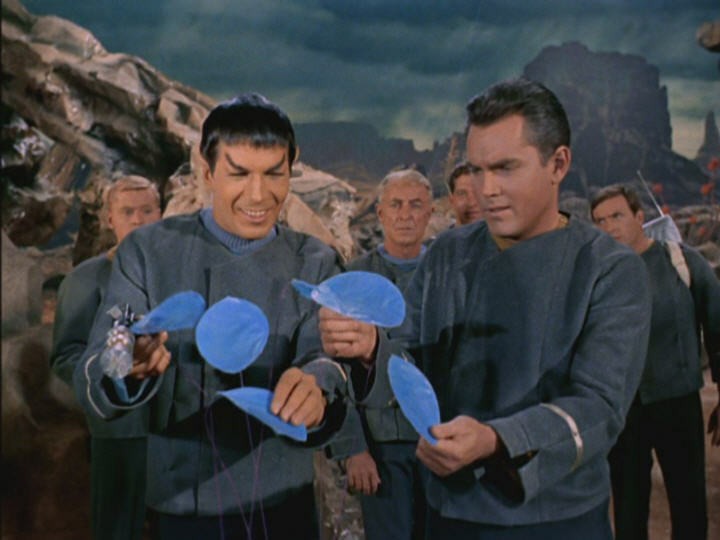 The cold, calculating belief that Mitchell should be killed to save the ship runs counter to the Spock we see later in the first season, when he believes killing the Horta in “Devil in the Dark” would be a crime against science. Some of the dialog from Dehner could have come from Spock later in the series. Indeed and some of the dialog from Kirk could have come from McCoy (“Can you take a moment to feel?”). There are a few other stray items. It’s well-known that Kirk’s middle initial is “T” for “Tiberius.” But his initial appears as “R” on the tombstone Mitchell makes for him (I’ve heard it suggested that Mitchell really wasn’t that infallible). Meanwhile, Sulu’s use of pennies in his analogy for Mitchell’s evolution was odd. I know there are disputes over whether money was still used in the 23rd century, but it’s pretty clear that hard currency was no longer used, Oh, and the medical reports Spock reviews for Mitchell and Dehner look extremely antiquated. I’d say “Where No Man Has Gone Before” is the adventure pilot, while “The Cage” is Star Trek’s aesthetic pilot, and “The Corbomite Maneuver” is the philosophical pilot. Hence the decision to release the reviews of all three on the launch of this site. The first Enterprise! No bloody A, B, C or D… or E, or NX. It goes without saying that “The Cage” is the most foundational episode of all of Trek. We’re introduced to so much that explaining it all would take too long. But, the big items include the Enterprise itself and the general look and feel of starships, a (somewhat) multi-ethnic crew with women (or, at least, a woman) in positions of authority and a main character who’s an alien (Leonard Nimoy, appearing for the first time as Spock). Most importantly might be the idea that Earth is fine and has developed to the point where it has ships exploring and colonizing the galaxy. One of my favorite moments of the episode is the way the creators slipped that idea in — “Same old Earth and you’ll see it very soon” — when Pike and Co. meet the “survivors” who ask if Earth’s all right. Whether intentional or not, the moment sets up the “positive future” idea that’s so core to Star Trek. Naturally, some of the concepts aren’t fleshed out yet (there’s no mention of Starfleet or the Federation). But they, of course, will come. Probably the biggest issue comes from the dialog surrounding the crashed survey vessel’s apparent lack of warp drive. One of Pike’s crew tells the “survivors” on Talos IV that the “time barrier” has been broken — possibly, an allusion to warp. I suppose it could mean something else. Maybe in the previous 18 years, some other advancement happened that negated a “time barrier” that kept ships from going very, very fast at warp? I’m sure there’s some elaborate, expanded universe explanation, but it still doesn’t make much sense if you figure the survey vessel got to Talos IV in the first place. And there’s no dialog to indicate it was a sleeper ship. This is part of a larger issue that we see in a lot of TOS, where the galaxy seems extremely small and the creators don’t seem to understand (or care about) the difference between warp and impulse. Anyway, the survivors crashed 18 years prior to the events of this episode, and we know that humans had warp about 200 years before “The Cage,” (based on events later in TOS and “Star Trek: First Contact”). Lastly, Spock is, of course, way off in this episode. He’s the only character we see again — and he’s not quite the Spock we know and love until about the 10th episode produced in the first season — but watching him smile when he and Pike find the blue floating leaves is a really odd moment. It’s sort of a classic moment, too. Sometimes, Star Trek’s mistakes are an interesting part of watching its evolution. Of course, many fans have only seen “The Cage” through the two-part “The Menagerie,” where the pilot’s footage was reused in a flashback. Either way, what we see is sort of fascinating (to borrow a phrase). It’s quite odd that the pilot is so light on why humans are in space in the first place. Most of the character moments revolve around Pike’s internal struggle about whether being a starship (or, spaceship, based on this episode’s dialog) captain is worth it to him after an incident that occurred prior to the episode, leaving some crew members dead and others injured. Once captured, there’s a lot about humanity’s hatred for captivity. It’s not bad stuff, but it’s not particularly introductory to Star Trek. We don’t get a lot of big picture info. That said, a lot introduced here does become part of what we watched for the next 40 years (50 years, in reruns). The Enterprise design, transporters, weapons, uniforms, the way the ship works, etc., are all generally started here. I’d say “The Cage” is Star Trek’s aesthetic pilot, “Where No Man Has Gone Before” is the adventure pilot and “The Corbomite Maneuver” is the philosophical pilot. Hence the decision to release the reviews of all three on the launch of this site.